For our Friday hike in the Gorge we are headed up! The Angels Rest trail is one of the most popular trails in the Gorge (for a reason), so we recommend getting an early start. 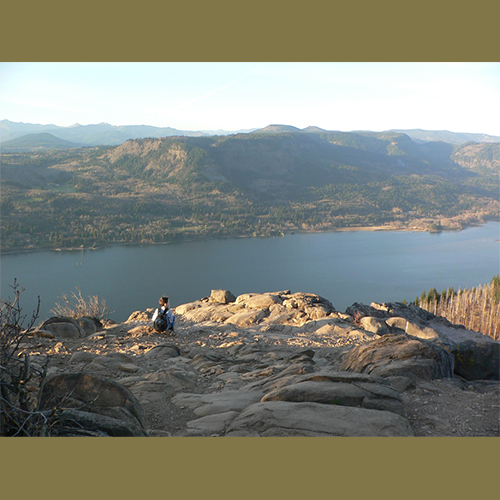 The 1,400ft elevation gain will be worth it the second you reach the summit and are rewarded with a spectacular view of the Columbia River. Angel's Rest is an exposed bluff on the Western end of the Columbia River Gorge. This summit is characterized by a long, rocky spine surrounded on three sides by cliffs, boasting a striking 270 degree view! While you can't see any of the Cascade volcanoes from the top, you do get great vantages of Beacon Rock, Silver Star Mountain and many other landmarks. The real draw, however, is the perspective of the river below - like you're on a balcony over a great auditorium. Its near-2000 foot prominence, and its proximity to the Columbia River give you the false sensation that you could dive from the summit to the water below! Getting to this precipice takes a relatively short hike (2.4 mile one-way) with an easy to moderately-steep ascent. Its bang-for-the-buck makes this a long-time favorite of families and hiking clubs. When you consider that the drive time from downtown Portland to the trailhead is under 45 minutes, it is understandable how popular this destination can be on sunny summer weekends. The trail passes two waterfalls along the way, an overhead view of Coopey Falls and a quick detour to smaller Upper Coopey Falls. The forest expanses surrounding the summit burned in a fire back in 1991, and lots of charred evidence remains. It is a unique landscape - one quite varied from other locales in the Gorge. Angel's Rest, while a worthy destination by itself, is also a favorite stopping point for longer hiking loops in the area. Don't be surprised if you even see backpacking thru-hikers taking a breather at this splendid rest-stop. Note for families: While, there is plenty of space to avoid danger at the top, but it should be noted to keep little ones close by to avoid them getting too close to the cliffside drop-offs. As one, somewhat nervous woman pointed out "There are no handrails".